Exchange mailboxes are used by companies for storage of information such as emails, contacts, and events, etc. With the assistance of email clients, this information available on the server can be fetched and modified. Sometimes data migration is required for enabling offline access while in situations where data corruption occurs in Exchange due to a malware attack or a system failure, migration of data to another platform can help in the recovery of the mailboxes involved. In today’s post, we will talk about everything you need to know regarding export and import of Exchange Mailboxes to PST files. So, without any further delay let us start this post. From time to time, a user might need to import or export data for taking backup of a mailbox, for testing a new environment or for responding to any compliance request. Usually, the data is imported or exported in PST file format. This format is convenient for all types of situations. Before carrying out the import or export tasks of Exchange mailbox, you need to have specific user rights or the prerequisites. • Open ‘Active Directory Users and Computers’ for the creation of a security group named ‘Mailbox Import-Export’. • Once the group has been created, add your account to it. New-ManagementRoleAssignment -Name "MailboxImportExport" -SecurityGroup "Mailbox Import-Export" -Role "Mailbox Import Export"
with the appropriate security group name. • Log off the system and then back on in order to make the new role active for your account. • For access to newly created PST files, create an Exchange network share for their storage. • Add permissions of read/write to ‘Exchange Trusted Subsystem’ group for this network share. Following errors can occur during the export or import of Exchange mailboxes. 1. The error "MAPI or an unspecified service provider with ID no: 00000000-0000-00000000: Failure of message copying to the destination mailbox". To resolve this error simply grant ‘Send As’ permissions to the account being used for export/import with the command ‘Get-MailboxDatabase -identity “MAILFirst Storage GroupMailbox Database” | Add-ADPermission -user “DomainAdministrator” -ExtendedRights Receive-As’. In this command, ‘Mail’ is the Exchange server name and ‘Domain’ is the domain name. 2. The error "maximum corrupted item exceeding the mailbox limit with code no: -1056749110". The procedure of the export and import methods described here can be used on all Exchange versions newer than 2010 SP1. The following methods detail how you can import data from PST files into mailboxes. The commands listed here are examples, therefore, substitute the values as required. New-MailboxImportRequest -Mailbox username -FilePath \\fileserver\pst\username.pst -TargetRootFolder "RecoveredFiles" -IncludeFolders "#Inbox#"
Substitute ‘username’ with the alias of the mailbox owner that requires data import. The imported data will be present in the RecoveredFiles folder. with the name of mailbox owner. The imported content will merge with the existing data present in the archive. The following methods show ways to export mailbox to a PST file. Substitute the username with the name of the mailbox owner whose archive folder needs to be exported before running the command. in which the alias is administrator and location for PST file hosting is Mailpst. • Enter ‘y’ in order to complete the process successfully. in which exchange server name is mail, the database name is mailbox database and PST file location is mailpst. • Enter ‘y’ for completion of export. You can utilize reliable third-party tools such as Stellar EDB to PST Converter for a flawless conversion. This is an amazing tool used by professionals for online and offline conversion of EDB files into PST files. This tool can do both single and multiple mailbox conversions and has the ability to recover mailboxes that are accidentally deleted. 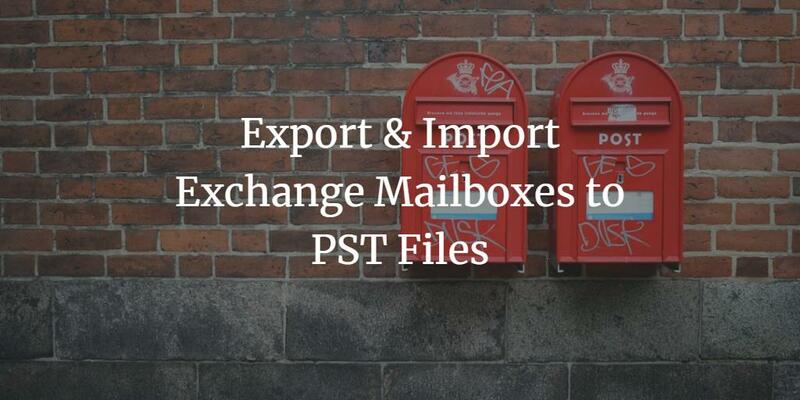 So, this was our take on how to export and import exchange mailboxes to PST files. We hope our article was helpful in explaining all the ways in which these imports and exports can be carried out. Let us know which method you have used in the comments below.